This will sadly be my last time joining you for the hops for 2017. I have a huge amount going on from Nov to Jan, including my little sister's wedding, and time will be at a premium. I might be able to get a post up, but I certainly won't have time to do any visits to other blogs, and I don't think it's fair to expect you to stop by and comment on my post if I can't return the favour. Therefore, I'll simply bow out for a few weeks and join you all again in Jan/Feb 2018. Wishing you all a great festive season, however you choose to celebrate, and I'll see you all again soon! Candy Corn, a chocolate bar, or Popcorn. Which of these snacks are your favorite to eat while reading? Freddy never knew exactly how well she remembered that encounter in the park. The real horror of school happened in the in-between bits, of which lunchtime was the worst. Sounds good. I have a science fiction book this week - The Collapsing Empire by John Scalzi. Happy reading! Love the cover! Sounds like a fun read! Happy weekend! Cuerva Lachance is a fabulous name! Well that book certainly sounds intriguing, and I love the cover. Thanks for the visit, Katie. I like chocolate myself! Great answer! Intriguing premise and gorgeous cover. Happy weekend! Thanks. Hope yours was good too. I love chocolate too. Hope you enjoy the rest of 2017. See you around the blogosphere in 2018! Thanks for stopping by my blog and have a great weekend! Thanks. We'll catch up in 2018! I hope you have a wonderful rest of the year, Nikki. I hope the wedding goes very well for your sister! I have a no food in bed rule, so definitely no snacks in bed while reading. I'm really not much of a snacker while reading anyway. I do love chocolate though . . . And I like popcorn. 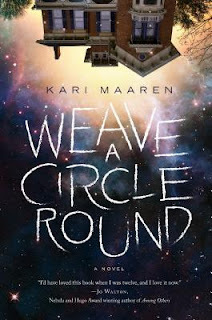 I like the sound of Weave A Circle Round! I hope it turns out to be good. Thanks. Hopefully all will go well. See you in the new year. That sounds really good and the cover looks great!